EDXIR-Analysis software is specially designed to perform qualitative analysis using data acquired by an energy dispersive Xray (EDX) fluorescencespectrometer and a Fourier transform infrared spectrophotometer (FTIR). This software is used to perform an integrated analysis of data from FTIR, which is excellent at the identification and qualification of organic compounds, and from EDX, which is excellent at the elementary analysis of metals, inorganic compounds and other content. It then pursues identification results and the degree of matching. 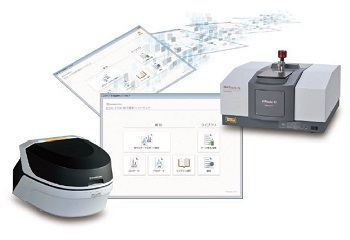 it can also be used to perform EDX or FTIR data analysis on its own. The library used for data analysis (containing 485 data as standard) is original to Shimadzu, and was created through cooperation with water supply agencies and food manufacturers. Additional data can be registered to the library, as can image files and document files in PDF format. It is also effective for the linked storage of various types of data as electronic files. To perform qualitative analysis automatically, simply click “Analyze Both Data” and select the EDX/FTIR data. This heightens the efficiency of data analysis and provides strong support for contaminant analysis. Тests With the data comparison function, which calculates the degree of matching between the actual measured data and the data registered in the library, the software can be used for countermeasures against "silent change" and for other confirmation tests. If data for a sample were acquired by instruments other than EDX and FTIR instruments (such as a chromatograph, mass spectrometer, or surface observation system), it can be converted into PDF format and then registered, enabling linked storage to the EDX/FTIR data.